Not a hugely productive week, but I did get a few things done. 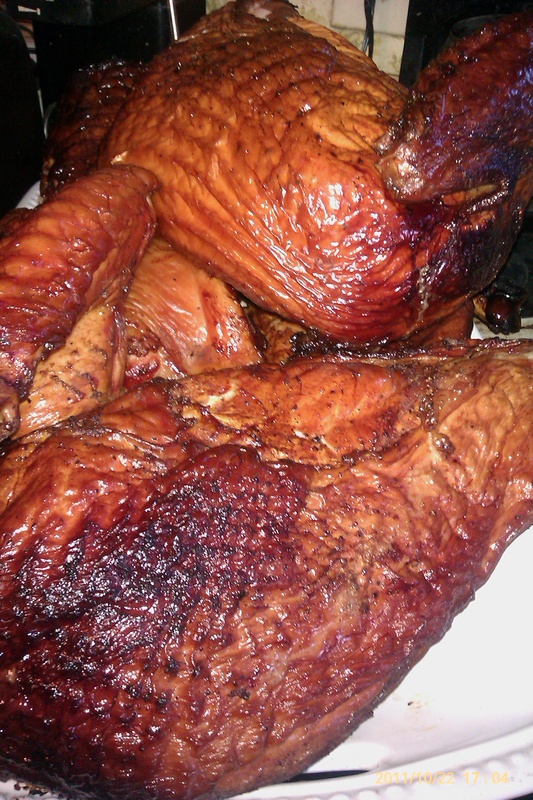 I made stock from the remains of the smoked turkey, which turned out very well indeed. Still need to turn it into real soup, but it is processed enough to set aside for a day or two anyway. Last night I washed up part of Midge’s fleece. Way more vm in it than I’d like, but I know that most will shake out, and I can pick the rest. 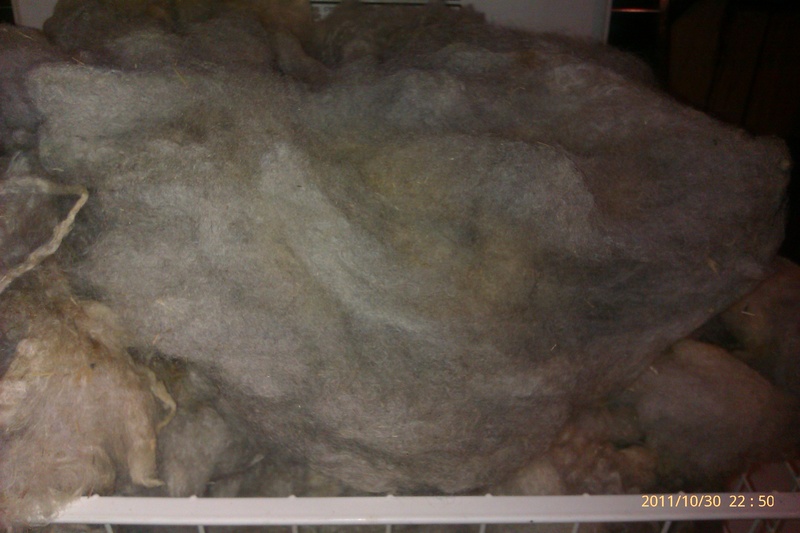 Once it’s dry I will combine it with some alpaca, probably 50/50. Should turn out really luscious. I finished the green socks for a friend’s child and started on a mostly purple pair for her other. 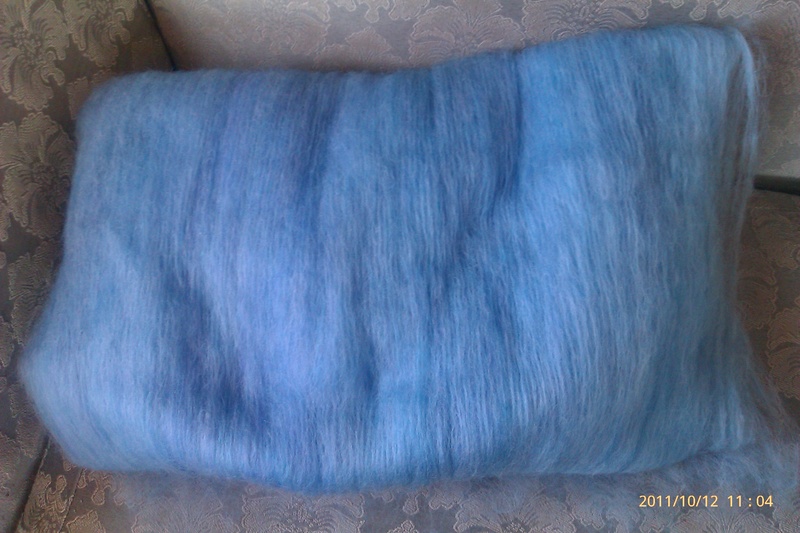 It’s amazing what a difference the dye lot can make. One both I have one skein each of 2 dyelots, and they look completely different! 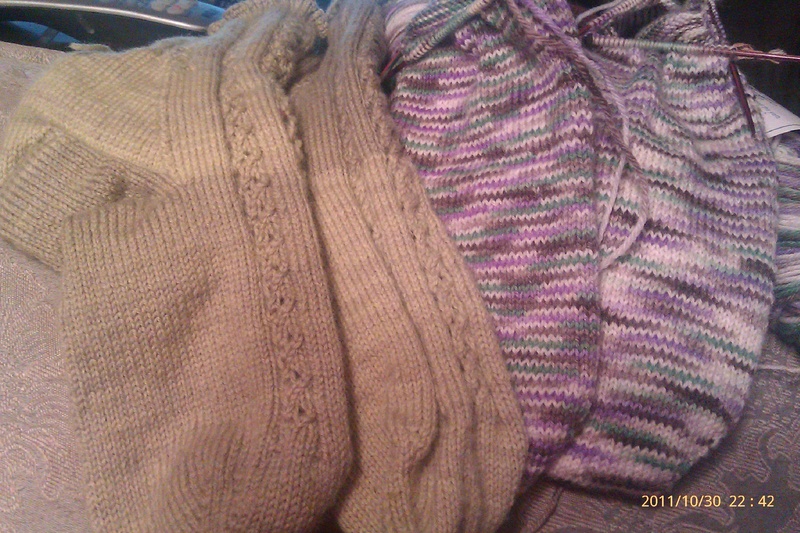 Both were started toe up, and on the green pair I switched skeins after the gussets. 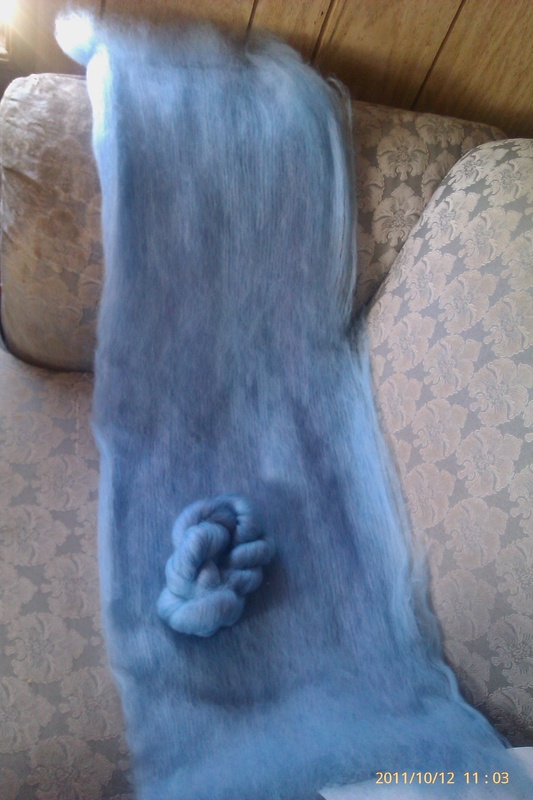 Not sure, but both may need to make a trip to the dye pot to see if I can even things out a little. 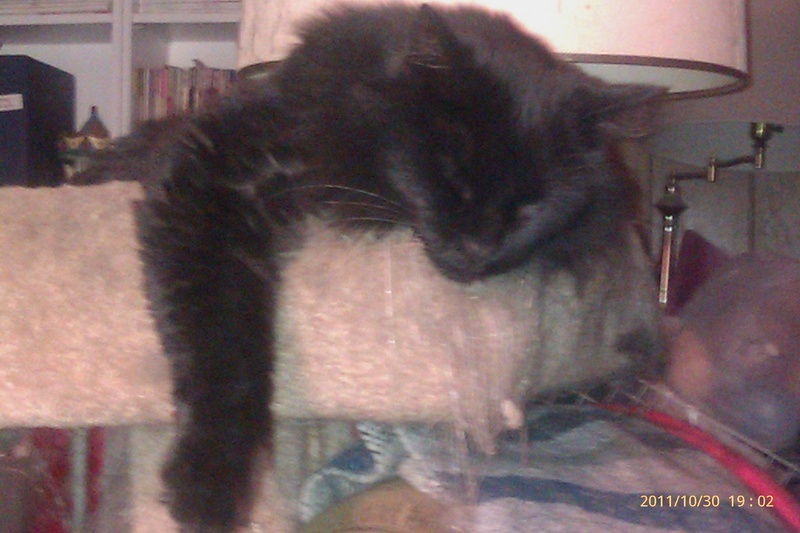 I’ll leave you with a shot of my “Halloween” kitty Burt. He’s big, black and fluffy. We got him at the pound when he was 4-5 months old. Our pound puts colored paper collars on all the cats, with names on them. I was there with the oldest and youngest kids (middle had declined to come with). They have several smaller rooms where several cats are together. We went into the smallest and checked out the 4 kitties. This one kept coming back to us, and when we checked out his collar, it had the oldest kid’s name on it! So home he came. Name had to be changed, and since we are big Stephen King fans, he got named after one of the characters in the Dark Tower series. He is 15 pounds of love, and he is the only cat I’ve had that actually takes down starlings (at a sometimes alarming rate! One time I found 6 of the in the ewes pen, all with a bite or two out of the breast). I tried getting a shot of him with his gorgeous gold eyes open, but as soon as he saw what I as doing he came over for a snuggle. 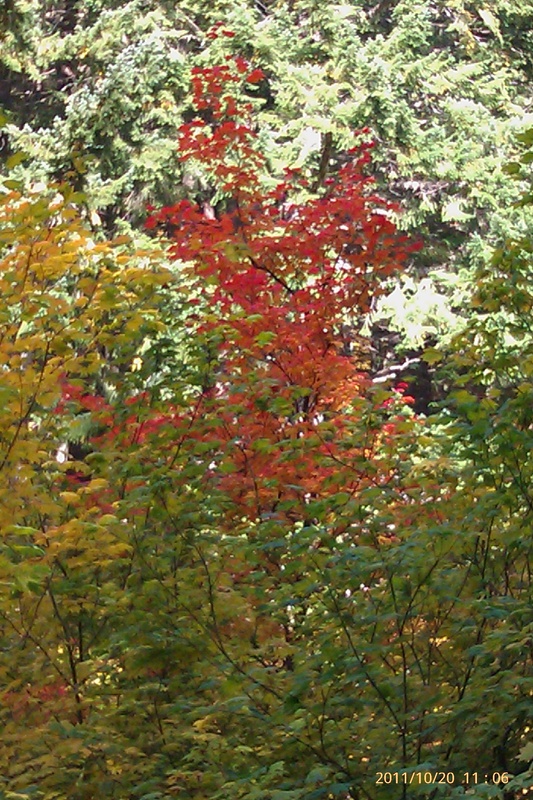 I love the fall colors. 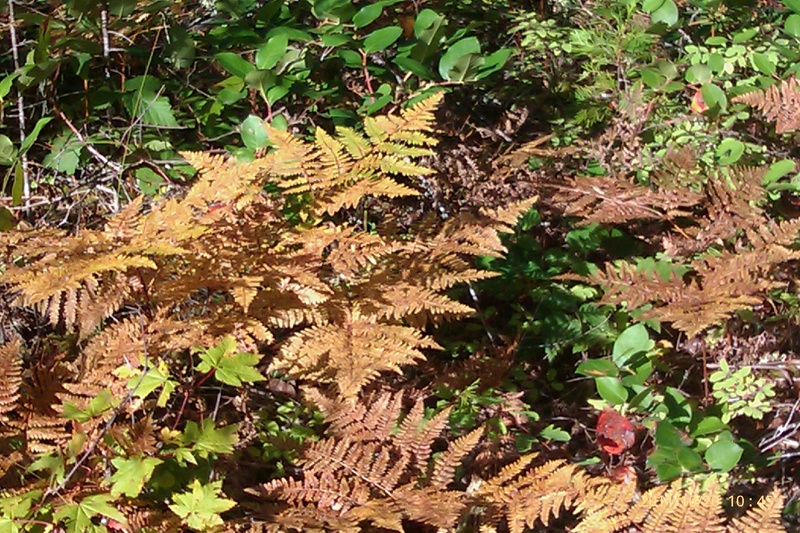 The ferns turn all bronze, and I especially like the red trees. Of course, the most beautiful all seemed to be on blind corners, where I couldn’t possibly stop and get pictures. I love trying to capture these colors while dyeing. In knitting news, I finished the alpaca lace Snowflake Peacock shawl. It still needs to be blocked, and I’ll post pictures once it is. I had to message the designer to get some clarifications on the pattern, but he responded pretty promptly. I was disappointed that the yarn was so fragile that it broke in several places both while being put into balls and while knitting, but we’ll see how it blocks. I think I will block gently, since I don’t want any more breaks. Thinking cap back on as to what pattern to use for the next one. That’s a whole batt, with a twisted one laying on top of it. Amazing how much space the open batt takes. This is the same batt folded in quarters. It is in my big comfy chair, and you can see it takes up most of the seat. It would take at least 6 of the twisted batts to cover the same area. The batts are harder to store. They don’t stack well and they can get damaged fairly easily, especially at shows when people are handling them. I usually untwist one so people can see exactly what they are buying, but that one usually becomes mine at the end of the show due to the handling that it undergoes. I’ve done a pound of this, so time to move on to the next pile. I’m taking a break for the Big Bag of Superwash and doing a half pound of Romeldale with silk and glitz. I finished the first batt last night, but I’m rethinking my ratios. I want more glitter. Pics when I get things right! I don’t count the chickens every day, but occasionally when I feed them I do a quick head count. Even on my worst days, I feel fairly confident that I can count to 10. Since when I moved the hens to the coop I started with 4 Barred Rocks and 5 Buff Orpingtons it was pretty easy to keep up with all of them, even if I can’t identify individual birds. I think periodically about banding them so I can tell them apart, but it really hasn’t been that important to me. Several weeks ago, before the turkeys took their trip to Scio, I counted heads and came up one Buff short. There were no signs of any sort of attack, no holes in the fence, no sign of her loose anywhere. I figured that a large bird of prey must have got her. We have eagles and Great Horned Owls in the area, so I thought that one of them must have taken her. Not happy about it, but there were no more disappearances so I moved on. I have one Buff that has decided for the last few weeks to go broody. Two major problems with that: (1) I don’t have a rooster, so it’s a waste of her time, and (2) even if I did have a rooster, this is the wrong time of year to raise chicks. At least twice a day I go out to the hen-house, pull her off the nest and toss her into the hen yard and collect the eggs that she is setting on. Last week I went out to feed and did a head count. Four Barred Rocks and 4 Buffs. Yay I think, I’ve finally gotten thru to the broody hen. I go around to the hen-house door to collect eggs and find my broody hen still setting on a nest. Doubting my mental acuity, I toss her out, then go back around and do another count, and come up with 5 Buffs. My missing hen is back! Never saw any sign of her loose in the yard, but I’m not going to look the gift chicken in the mouth. The next day I go out to feed. Three Buffs in the hen yard, and my broody hen in the house. I’m back to four. What the heck?! I head into the pole barn (which the hen yard backs up to) to look for a tool. Under the work bench I’m looking at I find a nest with 15 warm eggs in it, and I notice that the dirt under the back wall of the barn is low enough at one point that a determined hen (which apparently I have!) could squeeze through. The eggs make a quick trip to the compost heap, and a long board makes a quick trip to the hen yard to block off access under the barn wall. One problem/mystery solved. Now if I could just cure my broody hen! He was not really thrilled with the whole idea of being shorn again, but he is now in with the girls, and hopefully I will have lots of spotted lambs in March or April. Later than I like, but procrastination and pain have ruled my world this year. I tried using him last year but got no lambs. He was put out with the ewes that were on a leased pasture (summer camp), and the owner had put out 2 steers who were VERY interested in my sheep. To the point of licking them if they layed down! I am hoping that they interfered. Better than having a ram who won’t/can’t do his job. Fingers crossed for lots of loving tonite! Shearing him was a JOB. Not only was he fidgety, he’s big and very densely fleeced. On his neck and shoulders it is more boldly crimped, but his barrel is more breed typical. And gotta love his color. 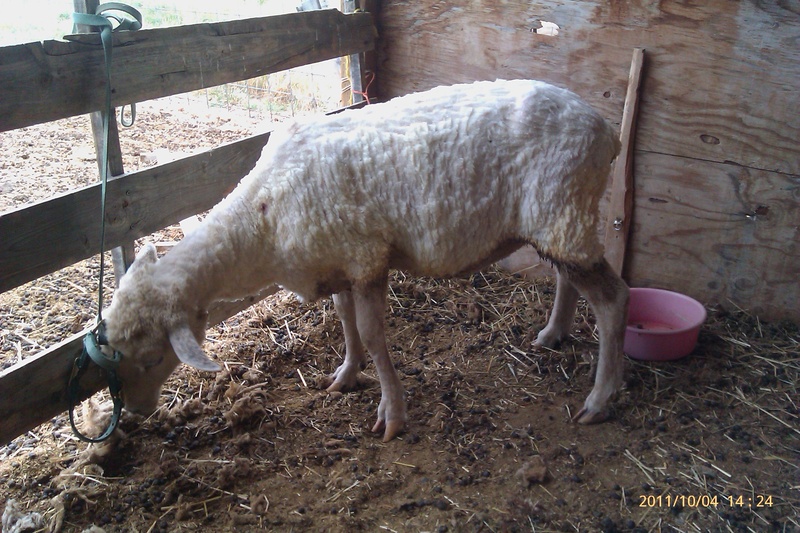 I (finally) sheared the last ewe! This is great cause for celebration. Now I just have to shear the ram and their fun can begin. I am way behind schedule this year, but hopefully it will all end well. Unlike last year. Today’s candidate was Amber. Again, not one of my favorites (why did I leave those 2 til last?). Amber is very stubborn, like Marge, and one of the most demanding sheep I have. If I am visible, she is demanding food. Doesn’t matter if I fed 5 minutes ago. She is sure that I must have more of the good stuff to hand out. This is why I put up with Amber’s attitude and mouthiness. This was her fleece at the shoulder. She is covered in spots. Some dark brown, some almost lilac. And all that pretty fine crimp. Yummy! A bear to shear, cuz it’s so thick, and she has fleece down all 4 legs. Very little belly wool. We started out with her standing, but she kept bashing her head into the barn wall, so I laid her down. Most of my sheep have at least one sweet spot where they enjoy being scritched, even the nutso Midge (I’ll tell her story next time). Amber does not want to be touched anywhere. Even laying down she fussed and fumed. I got most of the side done, then let her stand up again and we re-negotiated. She agreed to stand mostly still, and I agreed not to freezer-train sell her. I know how to flip and shear a sheep, but the back never thinks that’s a good idea. It’s easier on both of us if I do it with the sheep standing, or, if they won’t behave I lay them down on their side and lay a leg across their neck. They usually fall asleep when I do that. I’ve had a pretty productive week, at least by current standards. I used to be able to shear 3 or 4 sheep in a day without thinking about it. Now one a day or every few days is what happens. 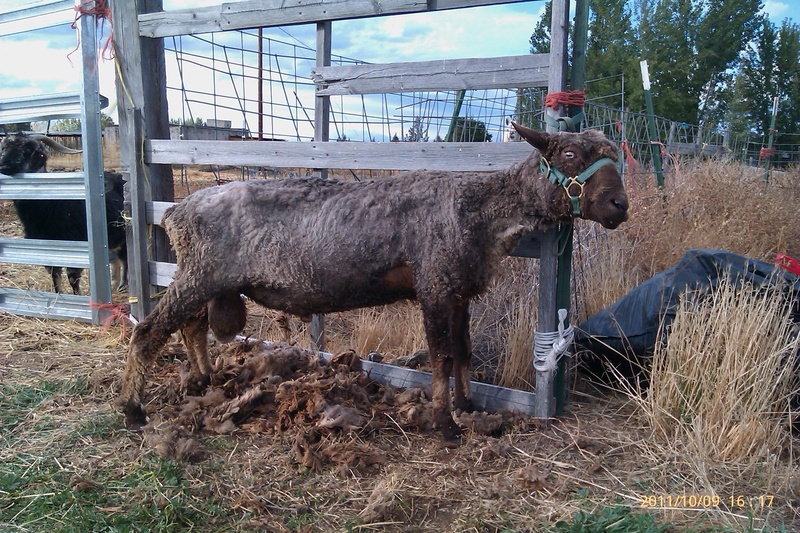 This week I got the last 2 ewes shorn, got 9 2-ounce batts carded (love my Patrick Green! ), went up on the roof and cleaned the wood stove chimney (not my favorite chore, since I’m afraid of heights) and caulked parts of the roof (we’ll see how well when it really rains ). 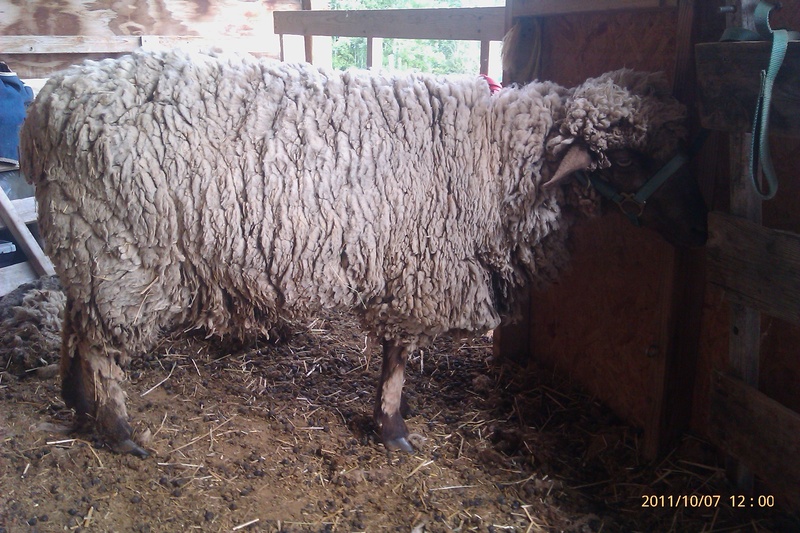 Tomorrow morning (back willing) I will go to spinning, and if it holds up I may shear Inesh (the ram). Or I’ll do him on Sunday. 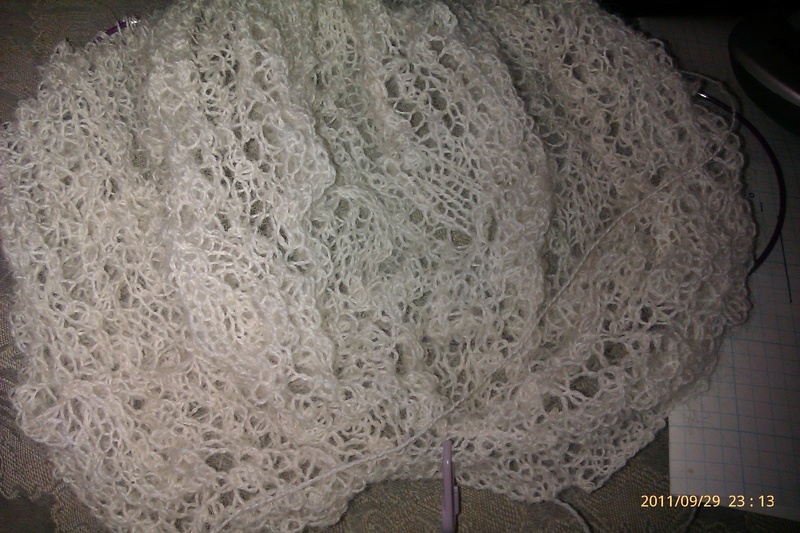 I am also making progress on the wedding shawl (no pics, since it doesn’t look like much right now). I’m up to 126 rows out of 210. Right now the rows are 562 stitches each, so they take up to 30 minutes each. Slow and steady here. I’m paying more attention right now, since I found a dropped stitch a couple of rows back. I was able to fix it without ripping back, which was kind of interesting since it involved a 3 into 1 decrease. But it all worked out in the end. No life lines here! No, not that season (though it is coming faster than I want to admit. I am referring to fire burning season. Started the first fire of the season this afternoon. Feels good! 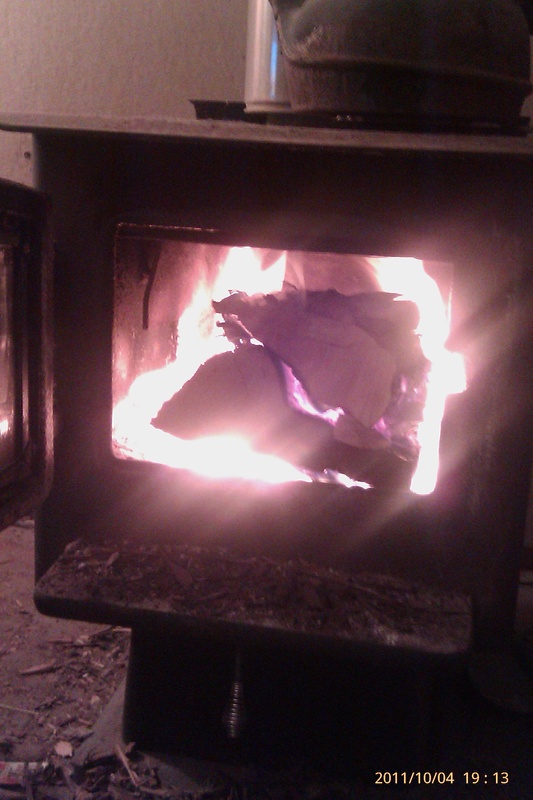 This is with the door of the woodstove open, just to get a better picture. 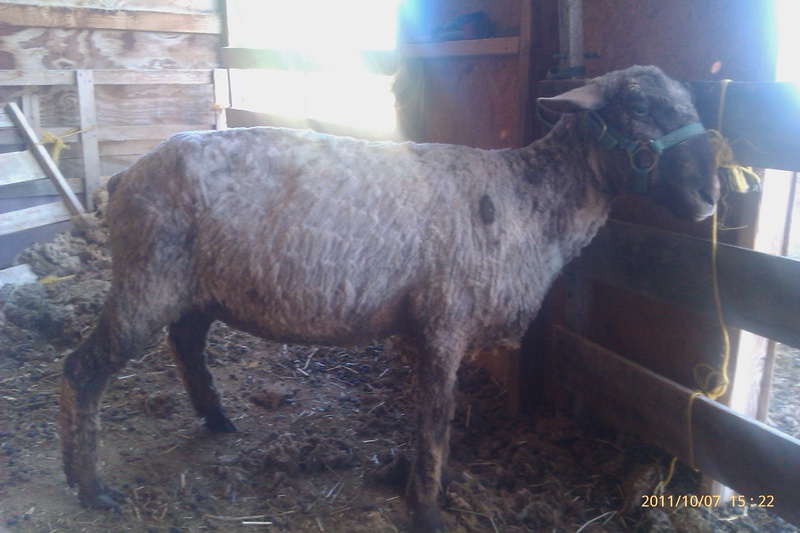 I also got a sheep sheared this afternoon. Marge moved slower than Amber when I got the ewes penned in the barn, so that’s who I did today. 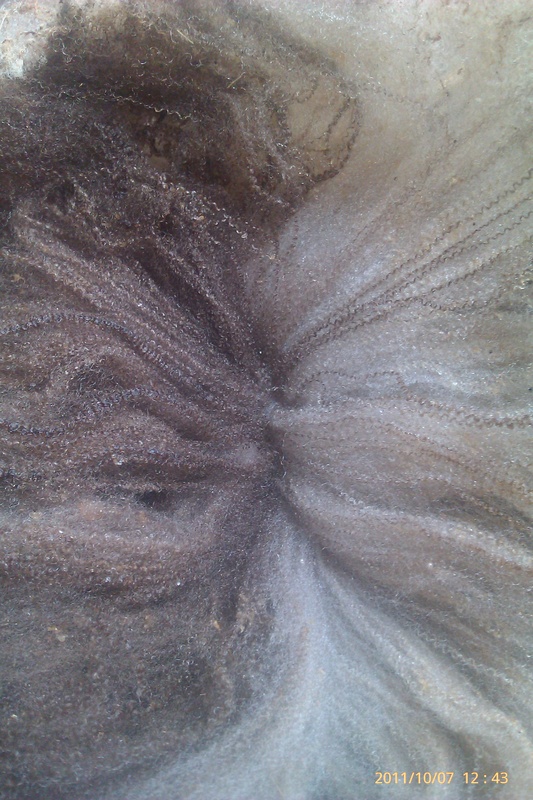 I tried taking a picture of her fleece so you could see the crimpy goodness, but there just wasn’t enough light to do it justice. 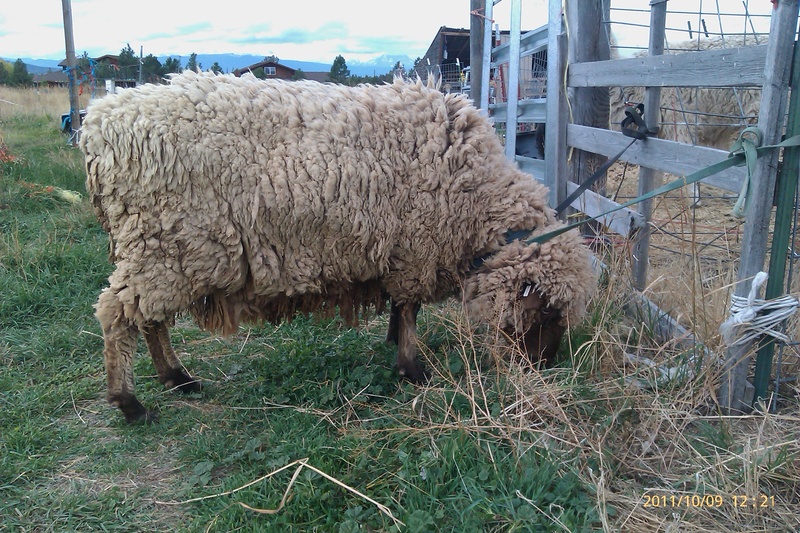 Marge may not be my favorite ewe (she isn’t very friendly, has a tendency to bite if I’m not quick enough when I’m handing out treats, and can be very stubborn), but she does have a lovely, easily sheared fleece. 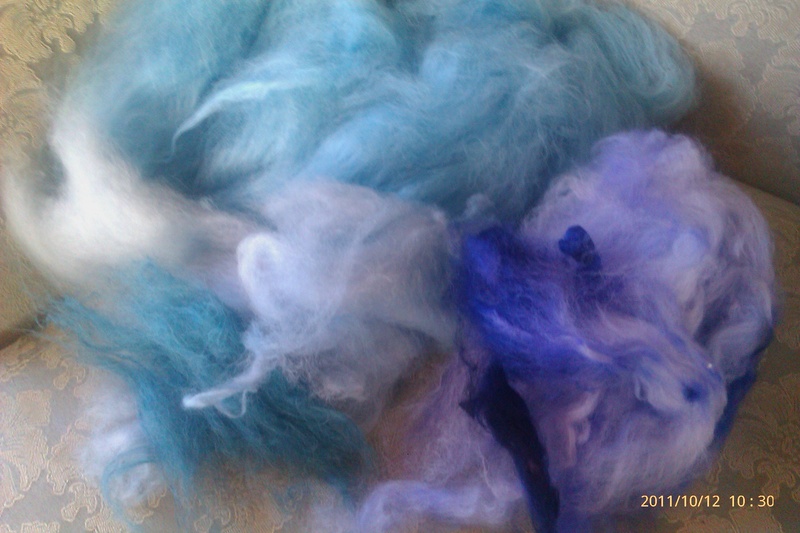 Clean face, no leg wool, and very little belly wool – so little waste. 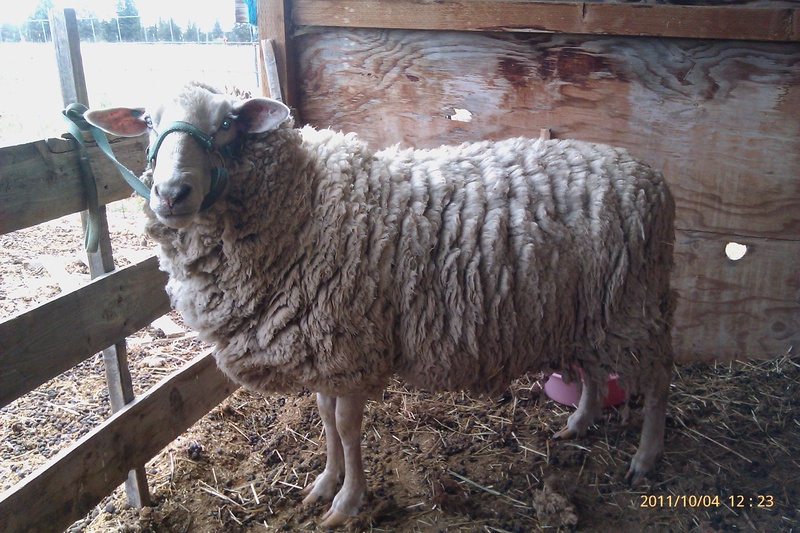 She was given to me because she had a really bad case of mastitis a few years back and her previous owner wasn’t sure that she would be able to raise a lamb on her own again. Her first year with me her udder was definitely lopsided. She had twins that year, a CVM ewe and a white ram. She rejected the ewe lamb (her first colored lamb ever), so I had a bottle baby, but the ram lamb was a very vigorous nurser, and went at both sides of the udder. The next year her udder filled out much more evenly. She only had a single (big) ram lamb, again a very vigorous eater. Her udder is a little lumpy now, but not much more than any other older ewe. That CVM ewe lamb is the only one I’ve ever had to help with. She has gotten used to the idea of colored lambs. She does her job – healthy lambs without help and a beautiful fleece. I can deal with the attitude. When I came in for lunch I happened to see a coyote trotting by outside my living room window. Now, I know that I have 2 bands of coyotes near me. I hear them almost every night. I know that they successfully raise pups every year, because I can hear the pups yipping when meals get delivered. But in 15 years on this property this is the first time I have seen one on the grounds. I’ve never lost anything to them, not a bird, not a cat, not a lamb. I count myself very lucky on all counts. 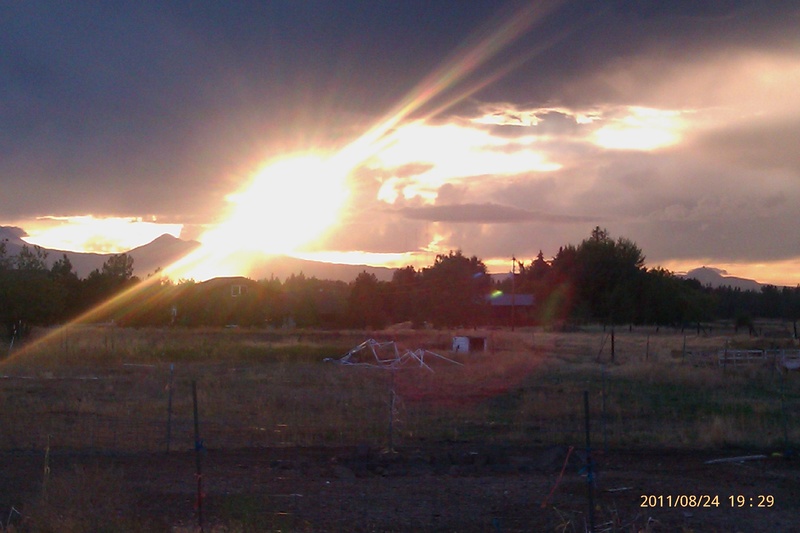 I hope nothing happens to the resident coyotes because so far they have respected my beasties. The picture isn’t very good. By the time I got outside he’d moved on across the street. 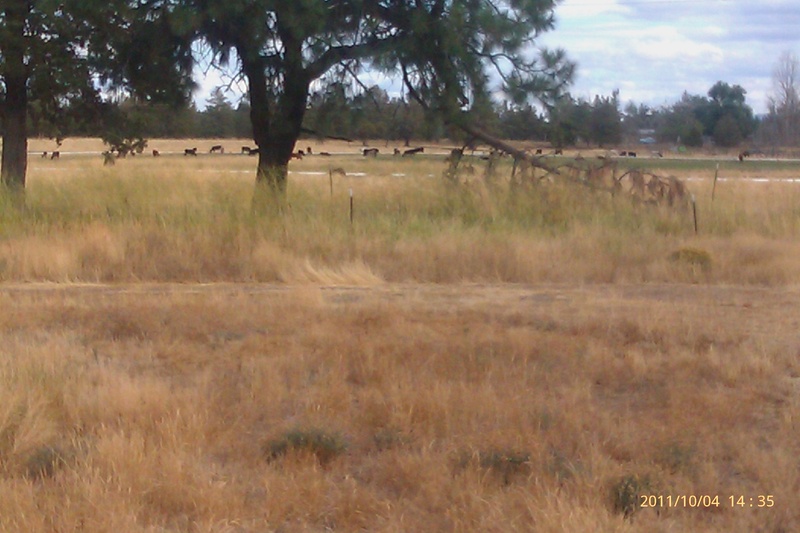 You can just pick him out near the white irrigation pipe, to the right of the center tree. He looked to be in good condition. I was glad to see him, but really glad when both my cats came back in for a bit a short while later. All in all, a good and productive day. Hope yours was too. I did a little shopping this week, and managed to find a few things that I can use for my booth. Went with my farm colors (black and red) for table colors, and will use gold for accents. Also spent a bit of time online looking at booth layout ideas, and got a few to work towards. I also started one of the spec wedding shawls, since I talked to my friend about using a corner of her wedding show booth in January to hang a few. This is the Snowflake Peacock from MMario on Ravelry. I’m doing it as 5 wedges (basically a semi-circle), using the alpaca lace I got from Laura. 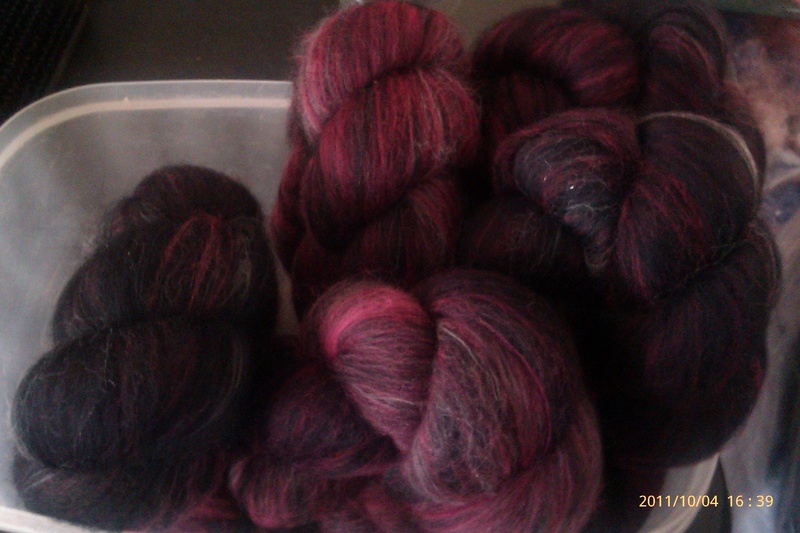 One skein went into a ball beautifully, but the other constantly fell apart, ending up in 8 balls of varied sizes. I’m working this one out of the many balls. It’s giving me lots of practise with joins. As always, at this point it really doesn’t look like much. I’m on row 102 of 200, so moving right along. Still need to shear the last 2 ewes and the ram and get a breeding group set up if I’m going to have any lambs next spring. Hopefully I can make a little progress on that front tomorrow. Now I am off to the drum carder for a couple of hours. If I can do a bit every week, maybe I’ll have more things to sell at the Fiber Market Day in March without doing it all at the last second. Tonites’ goal: at least four 2 ounce batts of superwash. I’ve got several pounds of mill ends to combine, so it’s just a start.